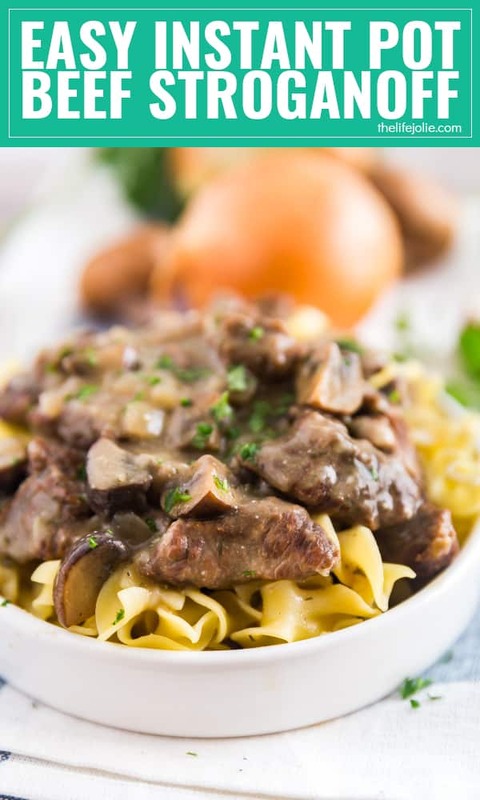 This Easy Beef Stroganoff Recipe is the perfect way to warm up on a cold night. With options for both the Instant Pot and Slow Cooker, this delicious comfort food has never been easier to make! I love having a good amount of recipes up my sleeve that are reserved for cold winter nights. I mean, I live in Rochester, NY. It’s pretty much a cold winter night like 9 months out of the year (I may be exaggerating, but only a tad!) Beef Stroganoff is one of those recipes. 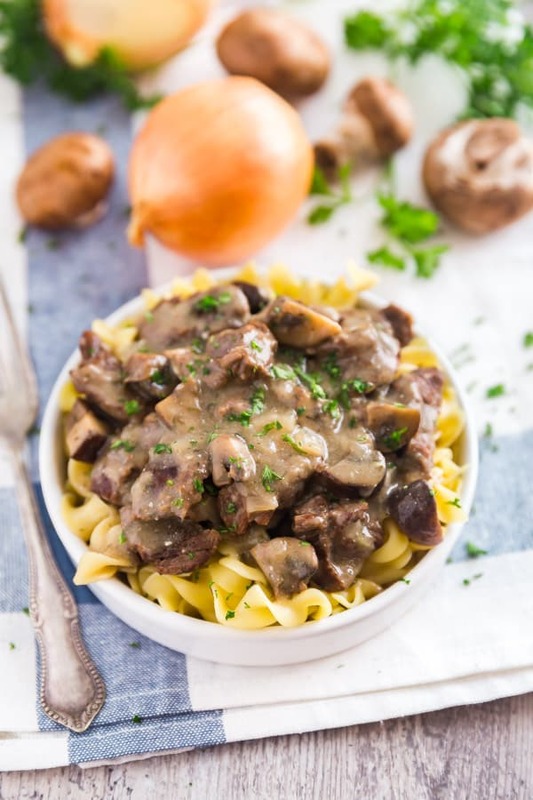 If I had posted this recipe a year ago it would have been called Slow Cooker Beef Stroganoff. 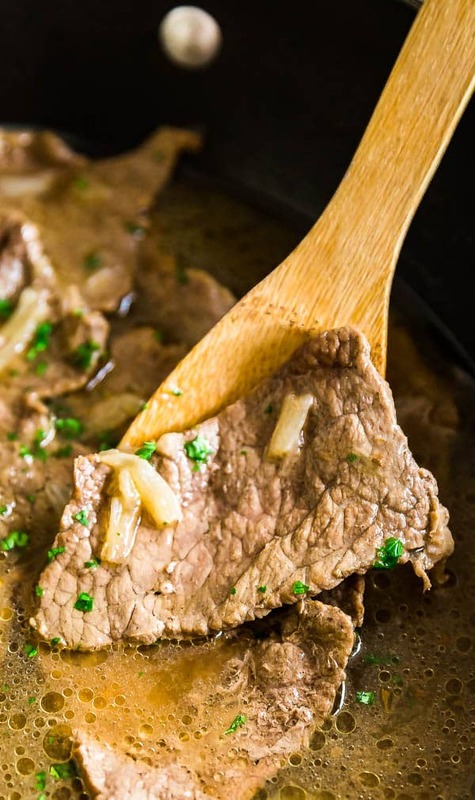 Because up until recently I always made it in the slow cooker because there’s nothing better than fall-apart-tender beef with mushrooms in gravy. But since I got an instant pot, I try to create recipes for both a Slow Cooker as well as an Instant Pot , so you guys can have options. This recipe has actually evolved over the years. 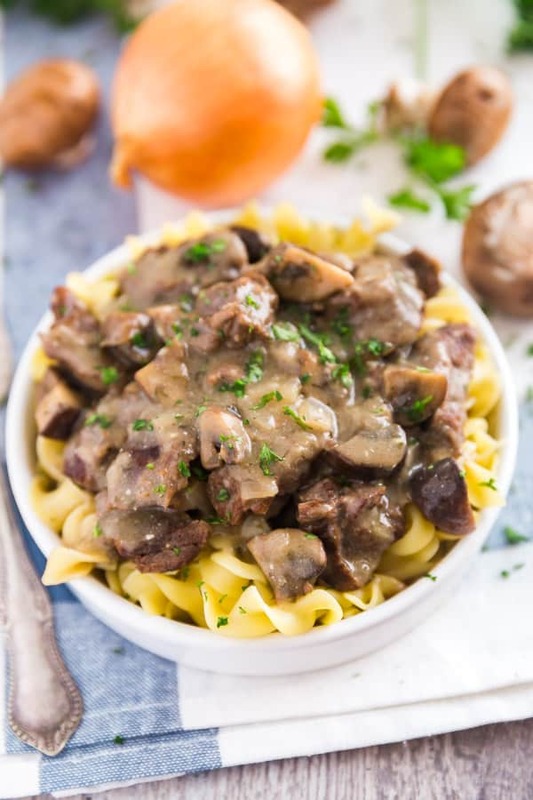 About a million years ago as a bright-eyed, bushy-tailed newlywed, I found a recipe for a slow cooker beef stroganoff. that I used to make all the time. This was before the days of Pinterest and back then I had all the recipes that I found online saved in a folder in an old yahoo email account. Somehow over the years, I lost the password to that email and cannot for the life of me remember any other emails that may be connected with it to get back in. I finally gave up trying to get into the account and grieved all those lost recipes. 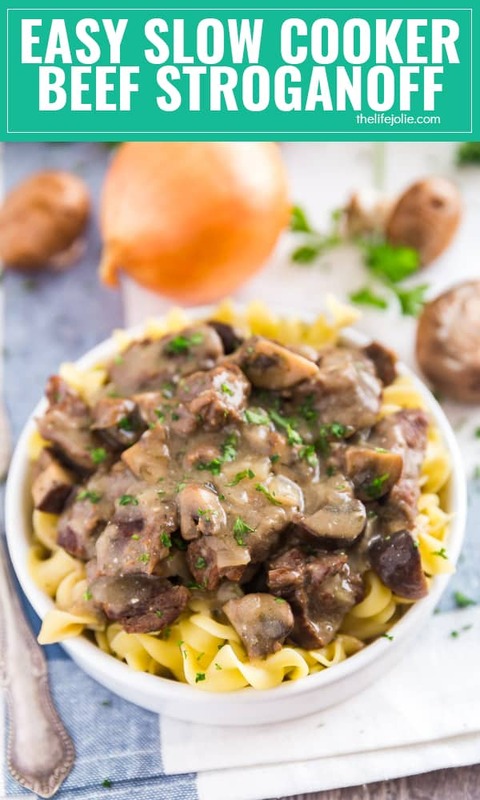 Luckily, I had made that one beef stroganoff recipe so many times that I had a basic idea of the ingredients that went into it. So I kept making my own version over the years and it evolved into a more set recipe that my family enjoys in our regular meal rotation. I think one thing that really changed the game with this recipe was the addition of a little white wine. It adds the most fantastic flavor and I strongly encourage you to use it. But if alcohol isn’t how you roll you can always substitute the same amount of extra broth. 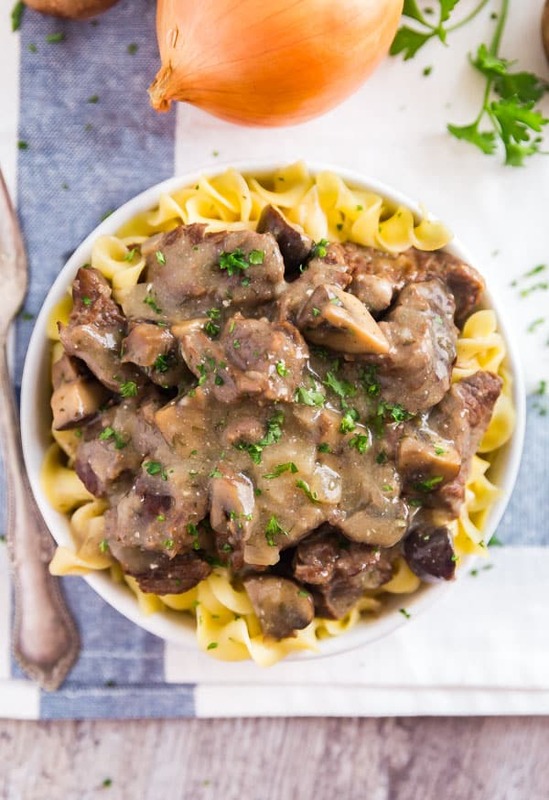 Either way if you’re looking for easy beef stroganoff, this is the recipe for you! Choose the saute setting and heat the oil. Pat the stew meat dry with a paper towel and season with salt and pepper to taste. Saute until the beef is almost brown stirring often, around 3 minutes. Add onion, garlic and mushrooms to the pan and continue to saute stirring frequently for 2 more minutes or until vegetables have softened. Add white wine to the pan and deglaze scraping and brown bits up from the bottom of the pan for one minute. In a separate bowl mix broth, 3 Tablespoons flour, dill, salt, pepper and parsley until well combined. Pour the broth mixture into the instant pot and press the cancel button. Cover the pot and change the setting to the Meat/Stew setting to cook on high pressure. Once its done, carefully do a quick release. When the pressure is fully released, remove the cover and change the setting to saute again. It will begin to boil almost immediately. Use a small amount of flour mixed with a little water to make a slurry. Slowly add some of the slurry into the pot and stir. It will begin to thicken. Keep adding the slurry until it's reached your desired thickness. Stir in the sour cream and serve over hot egg noddles. Heat the oil in a large saute pan over medium high heat. Place the beef mixture into the slow cooker and pour the broth mixture over it. 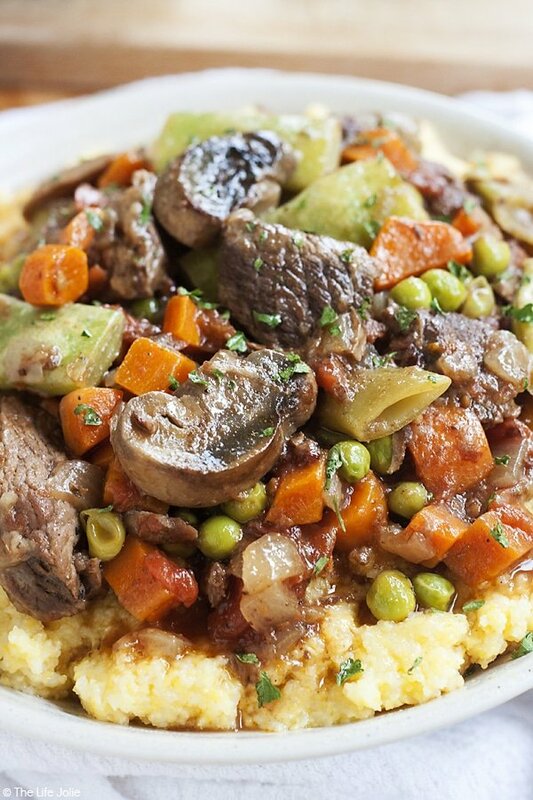 Cover the slow cooker and cook for 8 hours on low. (Optional Step you can always just skip to the next step) Remove the beef mixture to a pot over medium heat and add a flour slurry to thicken. Stir in the sour cream and serve over hot noodles. If you want these recipes to be a bit easier, you can skip browning the meat and pour all the ingredients (except the sour cream) into the instant pot or slow cooker and cook as per the directions. You can also choose to forgo thickening the gravy if you're happy with how thick it is, it's more of a personal preference thing.